holiday: Is the day a holiday? working day: Is the day a working day? First the data is read into r and the datetime is converted into date format. This has many benefits, one being ease of plotting against time. Next, variables are added to encode month and week. 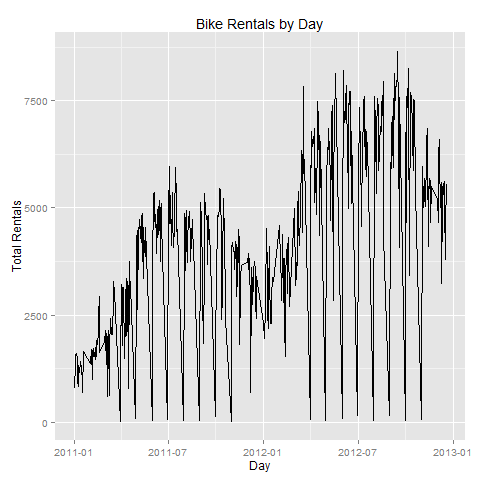 Plotting total rentals against hourly time is highly volatile (not many rentals in the middle of the night) and aggregating by day/month gets rid of much of this variation. Aggregation by month/day is done using the cut function on the datetime variable. Set the breaks of cut for whichever interval is needed. Next, three plots are created for total rentals vs. time at the hourly, day and monthly level. See the following r code and plots. There are a few things that can be gleaned from this graph. 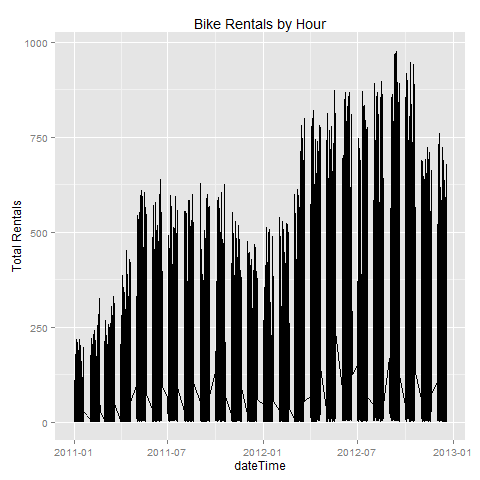 First, there are seasonal oscillations in the number of rentals. Warmer months have more rentals than the previous winter months. 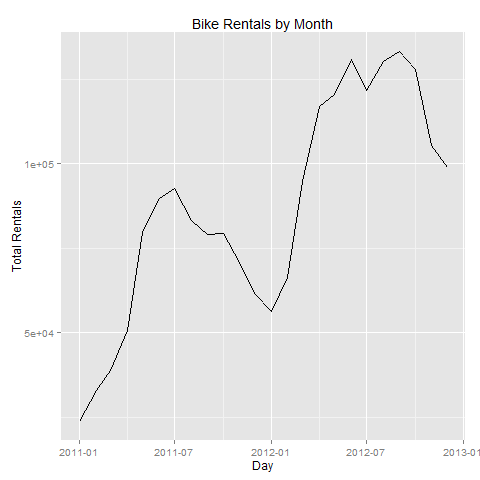 Secondly, there is an upward trend in bike rentals more generally. For example, the winter months of 2012 appear to have around the same average number of rentals as summer 2011. Something needs to be done with this trend. One option would be to eliminate the trend and seasonality effects. Another method would be to try an explain the upward trend more generally. For example, perhaps casual rentals can explain the growth? Casual renters may like the service, choosing to register themselves for greater future use. 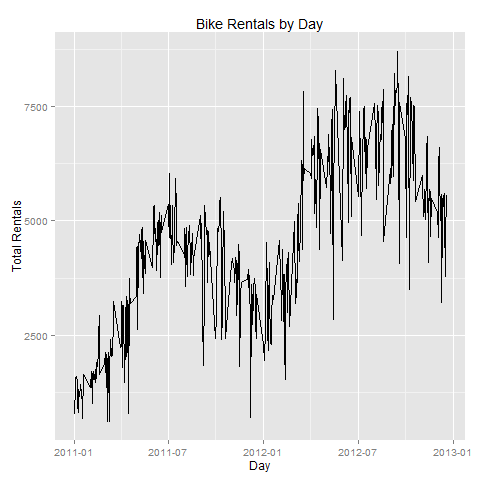 This entry was posted in bikeSharing, kaggle and tagged bikeSharing, Kaggle. Bookmark the permalink. ← Unexplained Variation in CA Child Vaccination Rates?